After 40 years of garnishing worker paychecks under the authority of Abood v. Detroit Board of Education, this week the Supreme Court held in Janus v. AFSCME that the coercion must end. In a 5-4 split, the Court today holds that the First Amendment prohibits states from giving public employee unions the special privilege of docking the wages of non-union members to support the unions’ collective bargaining and other political activities, without those workers’ consent. The Illinois law challenged in this case allowed the AFSCME union to steal $535 per year from Mark Janus and every non-union employee. PLF—and an array of allies—supported Janus as amicus curiae. For more, see our blog post here. Last year, in CTIA v. City of Berkeley, the Ninth Circuit rejected cell phone retailers’ First Amendment claim challenging the City of Berkeley’s ordinance requiring the retailers to display posters and other large documents warning against unsafe cell phone usage and including the city’s advice about “how to use your phone safely.” The retailers’ trade association, CTIA, petitioned the Supreme Court to review the case, and PLF filed an amicus brief supporting the petition. On Thursday, in the last order list of the Term, the Supreme Court granted the petition in CTIA v. City of Berkeley, vacated the Ninth Circuit decision, and ordered the lower court to reconsider CTIA’s claims in light of its decision in National Institute of Family and Life Advocates (NIFLA) v. Becerra. In that case the Court reversed the Ninth Circuit and held that a law requiring pro-life pregnancy centers to advertise abortions violated the centers’ freedom of speech. As explained further on the blog, PLF hopes the Ninth Circuit gets it right this time. Last Friday, we filed our opening summary judgment brief in Center for Environmental Science, Accuracy & Reliability, et al. 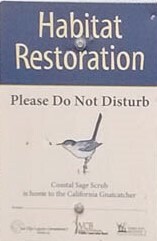 v. United States Fish & Wildlife Service, our challenge to the Endangered Species Act listing of the coastal California gnatcatcher. The ESA authorizes the listing of “subspecies” but neither the statute, nor any regulation, nor any guidance, defines just what a “subspecies” is. A few years ago, we submitted a petition to the Service arguing that recent genetic studies reveal that, under any reasonable definition of “subspecies,” the gnatcatcher isn’t one. Not surprisingly, the Service denied our petition, but the agency’s denial provides no definition for subspecies. In essence, the Service is operating under the “we’ll know it when we see it” principle, which mode of government operation invites arbitrary decision-making. Our summary judgment brief argues that the Service’s no-explanation denial is illegal, and that the agency must on remand articulate a clear and reasonable subspecies definition in deciding whether to grant our delisting petition. For more, see our blog post here. In Rentberry v. City of Seattle, PLF is challenging a year-long moratorium that Seattle imposed on innovative websites that allow tenants to bid for rental housing. The city has no evidence that these sites hurt anyone or clash with fair housing laws, but the city’s first instinct is to ban them anyway while it studies the websites further. This week, we asked the federal court to halt the website ban during litigation because this knee-jerk assault on web innovation so clearly violates the First Amendment. This week PLF filed a reply brief in Cherk v. County of Marin on behalf of the Cherk family, who spent nearly a decade getting a permit to split a single, vacant residentially-zoned piece of land in Marin County, California into two developable lots. Early in the process, County officials suggested they wait a year or two while the county land use ordinances were updated, on the premise that the new law might allow their lot to be profitably split in thirds rather than in half. They did wait, but the new ordinance was not at all helpful to the Cherks: it restricted development just as tightly as the earlier version, but also authorized the County to impose a new, nearly $40,000 “affordable housing fee” as a condition of getting thee permit. They ultimately paid and then joined with PLF to sue for a refund because the fee is an “unconstitutional condition” under federal law and a violation of state law against extortionate permit fees. We now await oral argument, likely to take place within the next 12 months in San Francisco.